The Swingline Stack-and-Shred 80X Hands Free Shredder presents an all new way in securely disposing of confidential information. Just toss in up to 80 sheets, shut the lid, and automatic shredding does the rest. The 80X Stack-and-Shred will cut a letter size sheet into 355 3/16" x 1 3/4" pieces. It can even shred staples and paper clips, plus oversize sheets and credit cards can be fed through the manual bypass. Whipser quiet operation lets you work uninterrupted while it shreds, and automatic jam clearance with manual reverse is included in the event of a paper jam. The Swingline 80X also offers automatic cool-down with LED indicator, and auto power save, conserving energy. With automatic shredding and so many user-friendly features, the Stack-and-Shred 80X would make a great addition to just about any home or small office. Auto shreds documents, paper clips, staples. Credit cards must be manually inserted into rollers in auto feed chamber. Shred Size: 3/16" x 1 3/4"
Glad I bought it Review by Graham W.
Works great. Really useful to just put a stack of papers in and forget it. Small staples are no problem. Only annoying thing is that if there's any glossy finish paper it seems to be challenging for the rubber "gripper" wheels in the mechanism to grasp it and pull it down through the cutter. Not a huge problem and it only happens once in a while. Simple fix, just remove the problem piece of paper from the stack and shred manually. This shredder is quiet, is really fast and no hassle. We have found it fine to load stacks of papers in and walk away, even when multiple pages are stapled together. We haven't had a problem with jamming. If something gets stuck the machine automatically reverses and works to get it out. The shredded paper is fine enough for security, but not too fine to handle. We use the scraps in out going packages. Our biggest complaint would be the scraps that fall out of the bin when it is being emptied. There are always loose pieces that hang from the cutters or cling to the sides and get knocked loose while reloading the bin into the machine. We have been pleasantly surprised. Introducing the new Stack-and-Shred 80X Hands-Free Shredder. It's a better way to shred. The 80X is ideal for personal, home office or executive use, shredding up to 80 sheets of paper automatically. The patent-pending hands-free auto-plus technology means that shredding tasks are now as easy as stack, shut, done. Waiting on your shredder is a thing of the past. The Stack-and-Shred 80X features cross-cut shredding and can even shred credit cards. While the manual feed is perfect for single sheets, thick, glossy or folded pages. It can even shred staples and paper clips in any corner. Automatic jam clearance and an easy-to-use LED user interface are just some of the features designed to make the operation and maintenance of the Stack-and-Shred a breeze, all while the space-saving design allows the 80X to fit neatly under your desk. Don't waste your time waiting in front of a shredder when you can be doing something else. It's time to delegate the shredding to your shredder with the new Stack-and-Shred 80X from Swingline. Transcript: Speaker 1: Thank you for watching the training video on the 80X. This is an exciting new Stack-and-Shred model for the year 2012. The video says it all so all I’m going to do at this point is turn it on in the back and let you watch the video. Speaker 1: Thank you for watching the training video on the 80X. This is an exciting new Stack-and-Shred model for the year 2012. The video says it all so all I’m going to do at this point is turn it on in the back and let you watch the video. Speaker 2: Introducing the new Stack-and-Shred 80X Hands-Free Shredder. It’s a better way to shred. The 80X is ideal for personal, home office or executive use, shredding up to 80 sheets of paper automatically. The patent-pending hands-free auto-plus technology means that shredding tasks are now as easy as stack, shut, done. Waiting on your shredder is a thing of the past. The Stack-and-Shred 80X features cross-cut shredding and can even shred credit cards. While the manual feed is perfect for single sheets, thick, glossy or folded pages. It can even shred staples and paper clips in any corner. Automatic jam clearance and an easy-to-use LED user interface are just some of the features designed to make the operation and maintenance of the Stack-and-Shred a breeze, all while the space-saving design allows the 80X to fit neatly under your desk. Don’t waste your time waiting in front of a shredder when you can be doing something else. It’s time to delegate the shredding to your shredder with the new Stack-and-Shred 80X from Swingline. Speaker 1: Thank you for viewing our 80X training video. I hope you enjoyed it and I’m sure you picked up on all of the features of the product. Basically, just remember that this is a deskside shredder and this, combined with the 100X and the 60X, makes the perfect array of price points to bring Stack-and-Shred cross-cut shredders into any office. Again, thank you for your attention and please view the other four other Stack-and-Shred training videos if you’ve not already done so. If you're looking for a machine with a high shredding capacity, the Stack-and-Shred 80X fits the bill. This cross-cut device can shred up to 80 sheets of paper at a time and best of all, you can just stick it in the machine, close the lid, and move on to something else. This shredder operates quietly so it's a good fit if you work in close quarters with other people. You will be able to shred your documents and people won't be bothered by the noise. The Stack-and-Shred 80X has a manual bypass mode and secondary feed opening. You should use these features when you want to shred up to 6 sheets manually. You also use this mode when you need to shred credit/debit cards. Whichever mode you use, you will be able to shred documents that have staples and paper clips attached to them. This will help you save time. This machine has self-cleaning cutters so you can expect the blades to stay sharp. Also, the device has a power-saving mode so you can reduce your energy consumption. Plus, this shredder has the ability to clear paper jams automatically so you can stay productive throughout the day. You will find that this device is really best for personal use due to its relatively small size. (You could easily store it under your desk.) The waste bin can hold up to 5 gallons of shreds and it pulls out like a drawer. This makes disposal really easy. Finally, the Stack-and-Shred 80X is backed by a 1-year warranty. As you can tell by reading about this shredder's strengths, you won't be able to shred CD's or DVD's with this device. You also won't be able to shred floppy disks. This shredder can work non-stop for up to 10 minutes. However, it then needs to cool off for about 40 minutes which could be inconvenient when you have a lot of shredding to do. The machine does have an LED indicator to let you know when you can continue shredding. 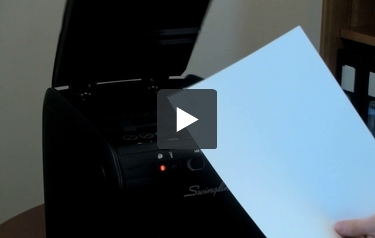 The Stack-and-Shred 80X is another great paper shredder from Swingline. This device has a lot of special features including the 80-sheet shredding capacity, the self-cleaning cutters, and the ability to automatically clear up paper jams. Plus, the shredder runs quietly and it's small so it won't take up very much room. Yes, this machine has a couple of weaknesses which you should take into consideration. However, if the weaknesses don't bother you, you'll probably love the Stack-and-Shred 80X. 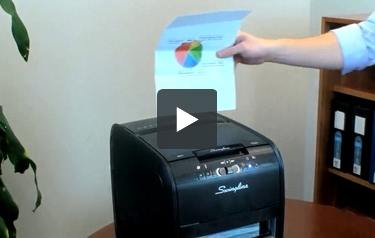 Check it out today to see if it's the right paper shredder for you. Shred Size 3/16" x 1 3/4" 3/16" x 1 1/2" 3/16" x 1 3/4"
What's the best way to shred junk mail with a Stack-and-Shred shredder? Junk mail can be flattened out and shredded during automatic shredding, or fed through the manual feed slot. .